A new modeling study conducted by researchers in Georgia Tech's School of Earth and Atmospheric Sciences shows that for decades, air pollution drifting from East Asia out over the world's largest ocean has kicked off a chain reaction that contributed to oxygen levels falling in tropical waters thousands of miles away. "There's a growing awareness that oxygen levels in the ocean may be changing over time," said Taka Ito, an associate professor at Georgia Tech. "One reason for that is the warming environment - warm water holds less gas. But in the tropical Pacific, the oxygen level has been falling at a much faster rate than the temperature change can explain." In the report, the researchers describe how air pollution from industrial activities had raised levels of iron and nitrogen - key nutrients for marine life - in the ocean off the coast of East Asia. Ocean currents then carried the nutrients to tropical regions, where they were consumed by photosynthesizing phytoplankton. "If you have more active photosynthesis at the surface, it produces more organic matter, and some of that sinks down," Ito said. "And as it sinks down, there's bacteria that consume that organic matter. Like us breathing in oxygen and exhaling CO2, the bacteria consume oxygen in the subsurface ocean, and there is a tendency to deplete more oxygen." 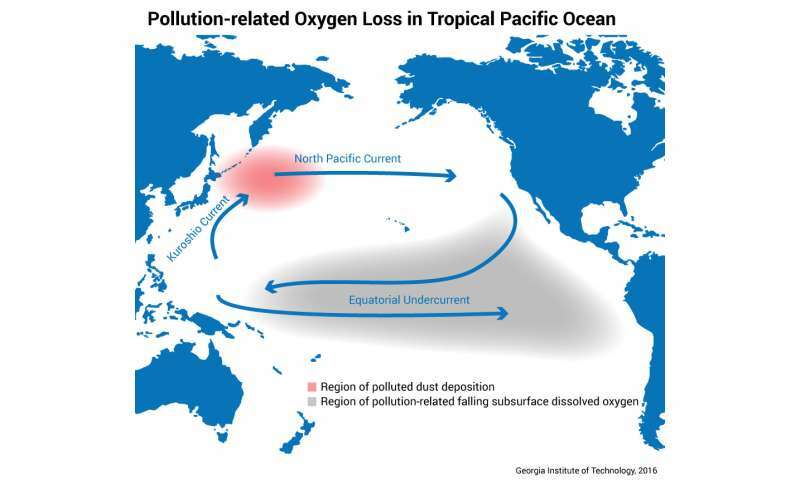 That process plays out in all across the Pacific, but the effects are most pronounced in tropical areas, where dissolved oxygen is already low. "The scientific community always thought that the impact of air pollution is felt in the vicinity of where it deposits ," said Nenes, who also serves as Georgia Power Faculty Scholar. "This study shows that the iron can circulate across the ocean and affect ecosystems thousands of kilometers away." "Many living organisms depend on oxygen that is dissolved in seawater," Ito said. "So if it gets low enough, it can cause problems, and it might change habitats for marine organisms." Occasionally, waters from low oxygen areas swell to the coastal waters, killing or displacing populations of fish, crabs and many other organisms. Those "hypoxic events" may become more frequent as the oxygen-minimum zones grow, Ito said. "Phytoplankton is an essential part of the living ocean," he said. "It serves as the base of food chain and absorbs atmospheric carbon dioxide. But if the pollution continues to supply excess nutrients, the process of the decomposition depletes oxygen from the deeper waters, and this deep oxygen is not easily replaced." "Dust has always attracted of a lot of interest because of its impact on the health of people," Nenes said. "This is really the first study showing that dust can have a huge impact on the health of the oceans in ways that we've never understood before. It just raises the need to understand what we're doing to marine ecosystems that feed populations worldwide." No more crappy stuff from Wal-Mart!! Ha this reminds me of the time when gkam/george kamburoff claimed that, because he had an MS in environmental management, he knew that manure dust (which he called 'volatile solids') was the main constituent of high air pollution in the central valley. That's 4 turds in one sentence. Quite a mouthful eh george? Ira gave you a five for your comment "That's 4 turds in one sentence.". Wow, are you folk unaware it is a reflection, a product of your character, not mine? I suggest you both give up on punishing me for being real while you are hiding behind phony names. George, serial lying reflects bad character, not risqué language. You're a lying cheating psychopath. Don't presume to lecture people about character.